The RailWay has come to Ankh Morpork, and with it comes a strange new kind of magic that has entrapped the citizens. But it is not a magic of fireballs and lightning. It’s a magic of the mind, the most mundane force in the world manifested in the obsessions with a grand new invention. But what manner of man can control the awesome power of Steam? And what man can direct this runaway train in a beneficial direction? The Industrial Revolution plotline in Pratchett’s books has been a bit hit and miss for me. The general topics that Pratchett explores during the books dedicated to this story are certainly interesting, but at the same time I can’t help but shake the feeling that something isn’t quite right. Maybe it’s my resistance to change. I originally started writing this review after having read Raising Steam, the first Pratchett book I’d read in a long time. But I enjoyed this book so much that I went back and read some of his other books, particularly the Moist Von Lipwig stories. And what I found was that compared to his previous books Raising Steam just wasn’t as funny. It was incredibly well written, a thoroughly enjoyable read, but something was still missing. In particular what was missing was humor for the sake of humor. 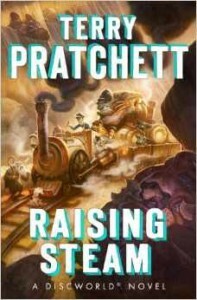 A lot of his other books are riotously funny, while Raising Steam prefers to focus on just the story. There are of course jokes, and they are of course funny, but not quite at the level I have found his other books to be at. A major concern is how easy it is for the characters to build the railroad. The main conflict of the dwarves rebelling against their king is fascinating, and an interesting look at extremism, but at the same time they are the only source of conflict and for most of the book they are fairly separate from the main storyline. I would have expected there to be more roadblocks for the railroad, but it seems that we move fairly rapidly from a state of there being no railway, to there being railways everywhere. An issue that stood out in this book is that at times the descriptions of certain events can be very vague. One gets the sense that something happened, but one also finds that one has completely missed the transition from a state of rest to a state of action. This is caused by the language not being direct enough. Rather than saying, “Two kids were about to be crushed”, Pratchett instead uses excessively figurative language that does not get the point across as clearly as it should. That is to say, of course, I did not hate this book. In fact I rather loved it and decided based on my reading of it that it was time to read through Pratchett’s catalog again. It’s just that it isn’t as strong as its predecessors. And yet, my complaints are rendered relatively void when considered against a body of work against which I have absolutely no complaints. If Pratchett isn’t writing as well in his advanced age, then I can hardly blame him. I’m just overjoyed that he is still writing and treat each new book as a precious mineral whose vein is about to be exhausted. But I still feel that as a critic I cannot ignore clear issues. It’s just that I’ll point those issues out, and then go on to gush about Sir Pratchett for everything he has done in the past. He’s like a grandparent that used to be a lot of fun but who has slowed down as he grows older. Sure he’s not as fun as he used to be, but that hardly matters when considering the memories I have of the good times we’ve shared. So no matter what, I will always love each new book that comes out, and I will most of all thank Sir Pratchett for creating a world where an untold number of stories could be told in, but where there is no ongoing plot to be left unfinished.